In the 21st Century it is rare to see a 'bust' made of someone. I think this artform began to fade when photography was invented. 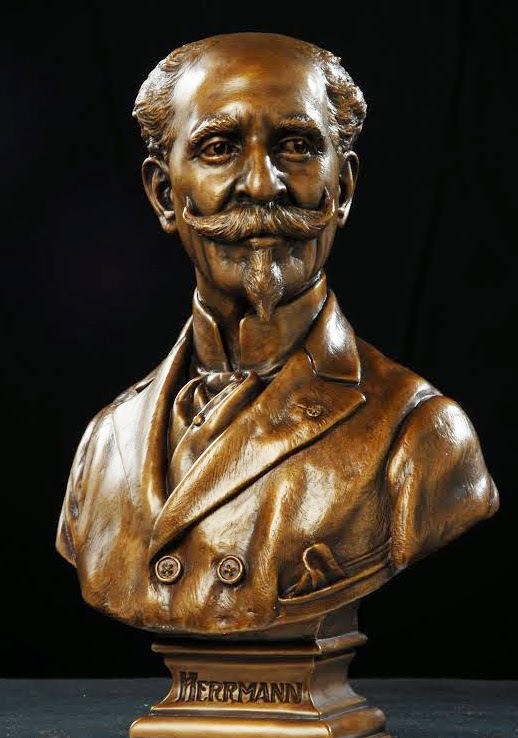 In the Victorian Era, busts and statues were often scene in well to do homes. Many of the greatest magicians of all time came out of this period in time. 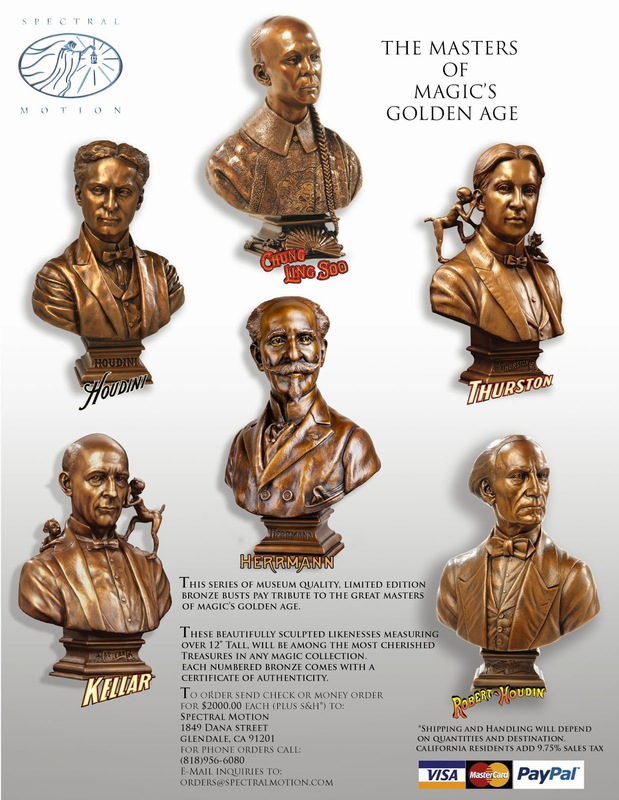 Well, a company called Spectral Motion, owned and operated by Mike and Mary Elizalde have created a series of bronze busts of 6 of magic's most famous entertainers. All of these individuals were born in the 19th Century. Please enjoy these wonderful works of art. Jean Eugene Robert-Houdin (b.Dec 7,1805 d. June 13, 1871) Known to all of us as the Father of Modern Magic. He was the great French Conjurer who we still revere today. Inventor of many incredible automaton like Antonio Diavolo and the Fantastic Blooming Orange Bush. Also, creator of incredible magic like the Ethereal Suspension, which in updated forms is still presented today. Another of his iconic creations was the Light & Heavy Chest, which was used not only to amaze and impress but also to stop a tribal uprising in French Algeria. A full size statue of Robert Houdin resides in front of the Maison de la Magie in Blois France. The GREAT Herrmann is considered by many to be the first in the line of the famed Mantle of Magic. He was also a Frenchman, like Houdin, but made his fame here in America. Originally, he worked with his brother Compars, until he went out on his own. Compars Herrmann was equally as famous in Europe as his younger brother was in America. The Herrmann's had a Mephistopholean appearance that added to their mystery and intrigue. Though he had a very mysterious appearance, his magic and performance was filled with comedy. He was also known to do magic off-stage in public places. Perhaps we should credit Alexander Herrmann with being the creator of 'Street Magic'! Herrmann died suddenly on a train in 1896. His wife Adelaide took over the show and was joined by her nephew Leon, who also bore a striking resemblance to Alexander. 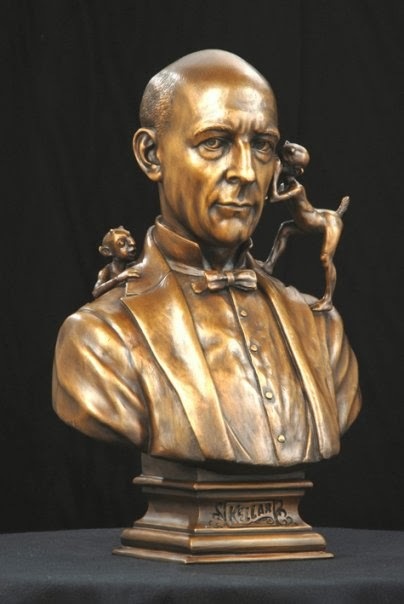 Harry Kellar (b. July 11, 1849 d. March 10,1922) Here we have the Dean of Magicians. So called, because he was the first 'Dean' of the Society of American Magicians. Harry Kellar was the first nationally famous American born magician. The second in line for the Mantle of Magic, though technically, it really started with him, though some do put Herrmann first. Kellar began his career as an apprentice to the Fakir of Ava. He went out on his own for a short time and eventually went to work for the Davenport Brothers. When he had a falling out with one of the brothers, he left them and took another employee, William Fay, with him. They toured North and South America and were heading to Europe when a ship wreck ended their tour. Kellar found his way back to the U.S. and rebuilt his show and went on to have a flourishing career. He and Herrmann, though not friends, shared a secret that I will reveal a bit later in this article. HOUDINI (b March 24,1874 d. Oct 31, 1926) The most famous magician in the world, who wanted to be known as an 'escape artist' for much of his life, and then as an actor, producer and later as an author and scientific investigator. Eventually, he would return to magic in a grand way with his Three In One Show of Magic, Escapes and Spiritualist Exposures. Houdini is likely responsible for inspiring more people into magic than anyone alive. I know my own push into magic came from discovering Houdini. The creation of the Magic Detective Blog, really has a lot to do with Houdini. There are 172 articles on the blog that are either about or that refer to Harry. The next closest is Harry Kellar with 32. 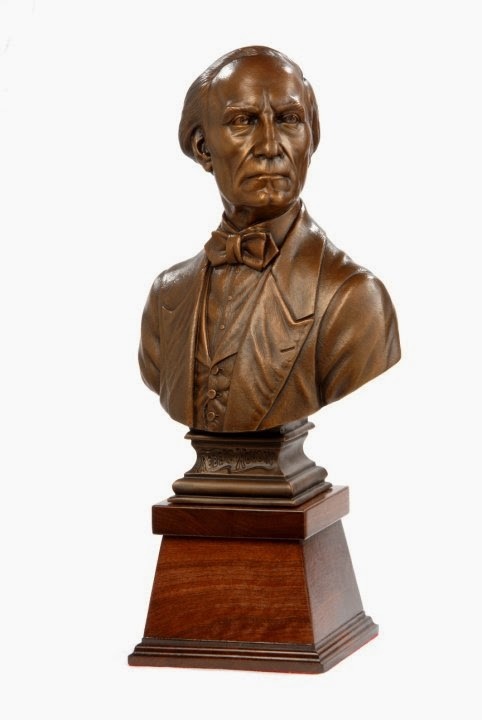 He is an icon, a legend and the bust of Houdini created by Spectral Motion captures Houdini in all his splendor. He looks confident, proud and defiant. It's a fantastic image of the Master Mystifier. If we talk of the Mantle of Magic, Howard received the Mantle of Magic from Harry Kellar in a ceremony at Ford's Theatre in Baltimore on May 16th, 1908. In all truth, it had more to do with Kellar selling his show to Thurston, but it sure made a great publicity campaign and a tradition that has continued up until present time. I always thought Thurston was a great performer. 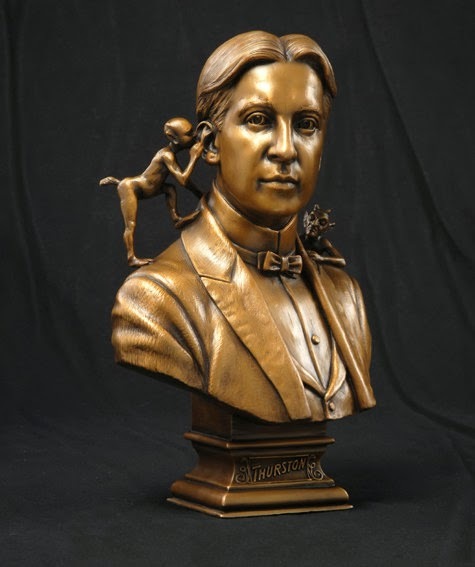 But I never quite knew the whole story until Jim Steinmeyer published an incredible biography on Thurston called, The Last Greatest Magician In The World. It is a must read for anyone interested in magic or magic history. Thurston had been making plans to pass the Mantle of Magic onto one of his associates, Harry Jansen, known professionally as Dante. There was never an official ceremony however because Thurston died suddenly. 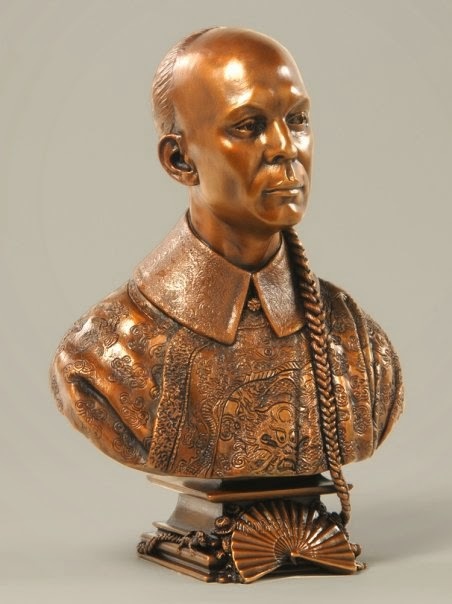 of people who were selected for bronzes, the one odd one was Chung Ling Soo, at least to me. He was born William Ellsworth Robinson and in all truth, his inclusion in this list is well deserved. Robinson worked for Alexander Herrmann. Later, he worked for Harry Kellar. Robinson was the 'secret' that I referred to earlier. He worked for the rival magicians before his own rise to fame. He was known as the most knowledgeable man in magic during his time. He played an important part in the success of both. Robinson also has a connection to Thurston. He allowed Thurston to show Leon Herrmann his version of the Rising Cards, and when it amazed Herrmann, Thurston publicized himself as 'The Man Who Fooled Herrmann'. The meeting would never have happened without Robinson however. When Robinson went out on his own, he failed miserably. It wasn't until he came up with the idea of doing an Chinese after seeing Ching Ling Foo, that things really took off for him. So convincing was he in his performance that the public was unaware that Soo was really an American. They truly bought into the idea that he was Chinese. He even used an interpreter when he gave interviews. He is the only real life magician who gets a spot in the movie 'The Prestige'. He also had one of the most tragic deaths in the history of magic having been killed while performing the dangerous Bullet Catching Feat. Special thanks for Mike and Mary Elizalde for providing all the wonderful photographs and for your great contribution to magic. *This article also appears on my MagicDetective Blog.